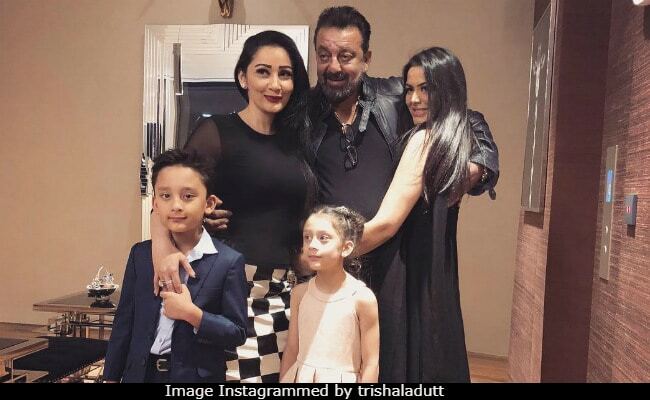 The Dutts are currently in Dubai - by the Dutts, we mean the "complete" family - Sanjay Dutt, Maanyata, twins Iqra and Shahraan and Trishala, (Sanjay Dutt's daughter with first wife Richa Sharma). Sanjay Dutt sliced out time from his busy schedule of new film Torbaaz to celebrate New Year with his family. In a pleasant surprise, Trishala also joined the Dutts for the New Year festivities and has been sharing photos with "papa dukes" on Instagram. But her caption for the family photo is endearing - "complete", she wrote for her photo with Iqra, Shahraan, Maanyata and Sanjay Dutt. Maanyata also shared a click from the family dinner and wrote: "The Dutts!" Trishala also roped in Sanjay Dutt for a customary selfie and this is how she captioned the photo: "Mean muggin' selfie. Pre-new year's celebration before the storm tonight!" While busy star Sanjay Dutt mostly features with the twins in photos on Instagram, courtesy Maanyata, their Instagram updates are closely followed by Trishala, who always 'likes' and posts adorable comments. Earlier this year, Sanjay Dutt released the trailer of his comeback film Bhoomi on Trishala's birthday, only to be surprised a while later with a letter from Trishala that was read out at the event. Sanjay Dutt appeared visibly teary-eyed as Trishala poured her heart out to the actor. Here's the content of the letter: "My dearest papa dukes, it feels so nice to know that you've chosen to launch the trailer of Bhoomi on my birthday as a surprise. It gives me so much joy to know that you've chosen a film based on a father-daughter relationship as your comeback film as well. I'm really proud of you Dad. You are stronger than you know. I'm blessed to be a part of you. I love you forever, Trishala." After wrapping the New Year festivities, Sanjay Dutt is expected to resume work commitments for Torbaaz and Saheb, Biwi Aur Gangster 3.